R-E-S-P-E-C-T: Do You Get It? Respect is perhaps the most important element in any successful long-term relationship…and that’s what we want to develop with our clients and colleagues, and even our family and friends. As they say, respect is not given, it’s earned. And there are certain things you can do to get more respect from others, and increase your professionalism and likeability in the process. We all know that we should treat others as we want to be treated, but sometimes we overlook that when we’re talking about respect. It’s definitely not a one-way street. One of the best things you can do to gain respect is to respect others by listening, and being courteous and compassionate. Another way to show respect is by being open-minded. Be willing to afford respect to everyone you encounter, not just clients or those who may be considered in a position of authority, including their opposing opinions, differences and experiences that make them who they are. 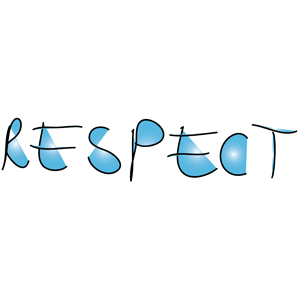 Respect doesn’t mean always being agreeable. In fact, if you frequently sit back and let other people determine how to treat you, you will probably end up getting walked all over. And if you get into this situation, it can be a difficult one to get out of. To gain respect, especially in business, you need to be clear, firm and unwavering with your policies. Avoid making exceptions and stick to your guns (in a nice and tactful way, of course) in order to inspire respect from others. Part of being firm and steady in your convictions is being able to make decisions and take a stand for what you believe in. Strive to be a decision maker who can make decisions without second-guessing yourself or showing doubt about the decisions you’ve made. Caring and emotionally investing in others in order to support their own success can also generate respect. Take time to focus on the needs of others and go out of your way to encourage, support and lend a hand when necessary. If you are truly concerned about the well-being others, you will put yourself in a position to be considered a strong, considerate and empathetic person, which can lead to increased respect. Having confidence will make it easier to do the rest of the respect-generating activities listed here. Because confidence is a result of having strong self-respect, you will live with a power that will draw people in and lead to gaining their respect. If you value yourself, your skills and your contributions, you will set the tone for respectful relationships. What do you do to gain respect from others? What do others have to do to earn your respect?